FIFTEEN thousand fans joining The Wolfe Tones in the haunting strains of ‘Grace' as Michael Conlan walks to the ring to face Olympic nemesis Vladimir Nikitin at west Belfast's Feile an Phobail. 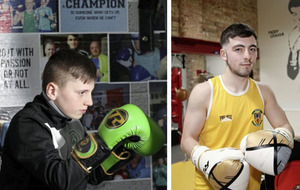 That's the 2019 vision for Conlan and he wants to end 2018 by winning the WBO Inter-Continental featherweight title at Manchester Arena on Saturday night. 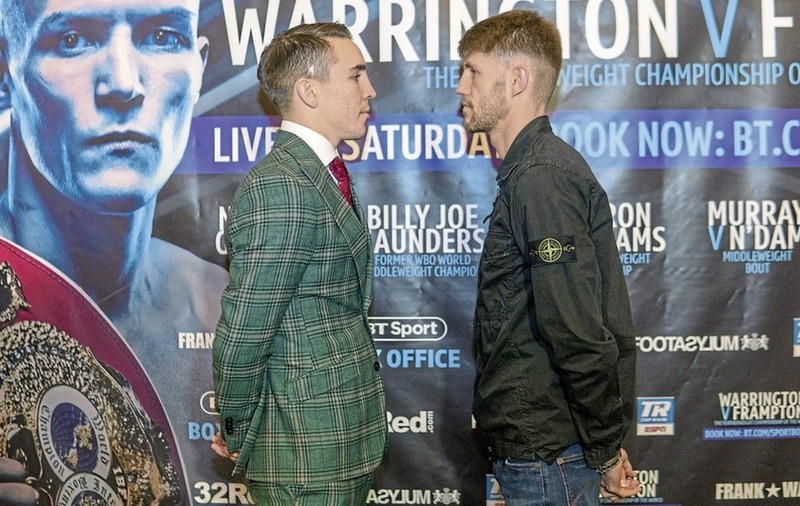 Conlan takes on former Commonwealth bantamweight champion Jason Cunningham and victory on the undercard of Frampton-Warrington will give the winner a top 10 ranking with the WBO. It will be a huge shock if Conlan isn't the man who gets his hand raised. The 27-year-old is looking forward to going home to spend Christmas with his family before a Madison Square Garden showdown on St Patrick's Day in New York and then that August date against Nikitin. But it's one step at a time. Yorkshire tough nut Cunningham will come to fight and he has only been stopped once in 29 outings. “I've done the hard work, it's all done,” said Conlan yesterday. “For me it's time to enjoy it. The fight is almost here – it's three days' away and Christmas is five days' away. “That's not dismissing Cunningham at all because I know he's a tough character and I know he's going to come to win. So am I. But I believe in every way I'm better than him and it's not like I haven't taken this fight seriously. “This will be my third real fight so I have really put a hard training camp in. I've been away from the family and I'm not coming here taking this lightly, I've come here to do a job and look good doing it. “I'm not just looking to get a win and I want to look good on Saturday night. Viewers on BT Sport, Eir Sport and ESPN in the US will know more about Frampton after Saturday night's fight. Cunningham may not have many household names on his record but he is a durable southpaw who intends to cause an upset. “I'm not going to walk in thinking I'm going blow this guy away because I know he's a tough guy,” said Conlan. “He can be tricky too, he's the first southpaw I've fought as a pro. I got a few southpaws in for sparring and at the start it was a bit tricky getting used to the style but I've got so many ways to deal with things and by the end of the camp I was flying. After spending the first year of his professional career in Manny Robles' Rock Gym hurt locker in Los Angeles, Conlan decided the time was right to move closer to home. He linked up with studious London-based fight guru Adam Booth and has never regretted making the switch. “Training with Adam is probably the smartest thing I have done in my career,” he said before yesterday's press conference at Manchester's Midland Hotel. “It's not just his knowledge of boxing, it's life in general. We work on styles for opponents and it doesn't matter which opponent, they'll work on every opponent. “What we've done for this fight has been great and I've been really happy with the preparation, I've had a great grounding from in LA, it was a tough time – not in terms of how I was feeling, but it was tough training. I came back because Shauna was pregnant and linked up with Adam and I'm very grateful he's training me now and giving me knowledge of boxing and life and everything. “It's how he connects with his fighters, I think that's very important. “You need a father figure-type guy in the corner, a best mate-type guy who you can connect with on a personal level as well as on a technical and boxing level and he's someone who brought that in. “He comforts you when you need it and gives you a hard shoulder when you need that. It's the perfect blend. I always saw he did that with his fighters and I thought he was the right person for me and I was correct. “The thing with me is I'm never going to agree with someone's opinion just because they say it, I've always been that way – it's one of my strengths. With a good performance and an impressive win behind on Saturday night his plans for next year include two more exciting dates – St Patrick's Day in New York and August in Belfast. “It'll be Sunday in the Garden,” he explained. So far he has fought in the Theatre at the iconic New York venue but he predicts an upgrade to “the big room”. “I'll definitely have a fight in the big room at the Garden,” he said. Of course that opponent is none other than Russian Nikitin (inset) the man who, through no fault of his, was awarded a win over Conlan at the Rio Olympic Games. 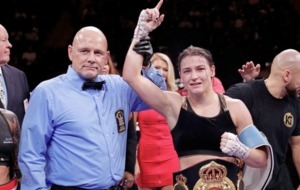 “I have no problem with him,” said Conlan. “He's not to blame, it was higher powers who were to blame. “I never want to have that feeling again, it was a horrible feeling and one thing I guarantee is that when me and Nikitin fight each other I will stop him. It will not go to the judges – I'll take him out of there and that's 100 per cent guaranteed.